The Zekate house has no set operating hours – ask in the Tourist Information Centre to arrange entry; admission is € 1.00. The neighbour has the key to let you in: the Zekate House itself is unoccupied. The fortified tower houses – known as kullë (kullë is Turkish for tower) belonged to wealthy individuals such as administrative officials or merchants. They all follow a basic layout: a secure stone lower storey topped by a wooden gallery where the principal rooms for an extended family are located. Embrasures are set in the walls to help defend against attacking enemies. The Zekate House is a particularly grand example of the typical kullë (tower-house). Constructed in 1811-1812 it has twin towers and a great double arched façade. The views of the town and the river valley below are spectacular. There are three floors; the ground floor contains storage rooms, a high ceilinged kitchen and the cistern. There is a central staircase which winds upwards through the building. The first floor has two rooms that were used as living quarters for branches of the family, while the third floor has a grand reception room and two other smaller rooms. 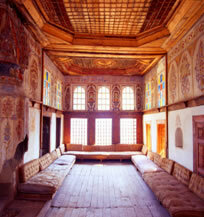 The principal room is very typical of the grandest of these dwellings with frescoed walls, a carved ceiling and an ornate fireplace. This level would have been shared by the whole family. At the centre of floor at the top of the staircase there is a wooden balcony overlooking the town. This has a raised section on which the head of the family would sit, meet his guests and watch what went on in the city below. A leaflet giving further details on the Zekate house is available at the Tourist Information Centre. Click here for a virtual tour of the Zekate House. Since the virtual tour is made from photos of 2003, some of them may not show the current reality. To view this tour quick time player is required.